Would you describe yourself as emotional? 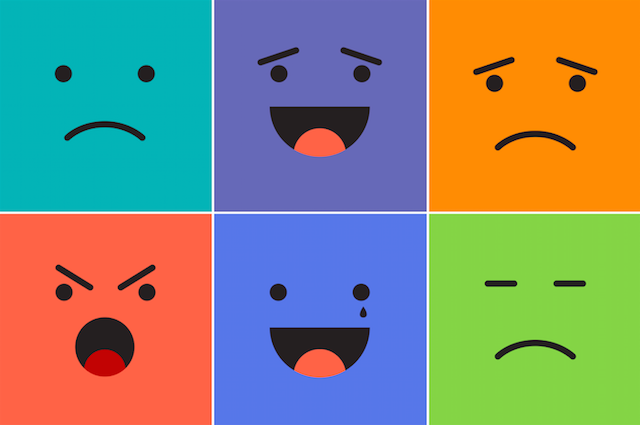 Do you feel like your mood can change instantly according to what happens in your day? Then you may be a slave to your emotions. Being an emotional person and leading with the heart can both be great qualities. Leaning into our feelings allows us to be more self-aware and helps connect us to others. But if we allow our emotions to dictate how we live our lives, it can lead to anxiety, depression, and even have a negative impact on our health and relationships. As an empathetic person who feels things deeply, I have learned this lesson the hard way. It took me many years to grasp the concept that all emotions stem from thought. As a young woman with low self-esteem, I didn’t realize that my negative self-talk and sensitivity to others’ opinions were having a profound effect on my emotions and moods. After years of faulty thinking about who I was and what I had to offer in life, I found myself in my doctor’s office clutching a prescription for anti-depressants. My emotions had officially taken control of my life. At the time I had no idea that each negative thought was having a compound effect on how I viewed myself and my life. The older and wiser me has learned to be very aware of my emotions and to check in with myself on several levels before allowing them to have the final say. Here are some of the lessons I’ve learned over the years to help me manage my emotions rather than allowing them to lead the way. When you find yourself riding the wave of emotion, it’s important not to dismiss those feelings. Emotions can be a lot like unruly children in need of attention. Once we validate them, we allow them to be seen and have a voice. Feeling our emotions is an important part of life; it’s what we do with them that can create problems. For example, if I’m feeling bored, sad, or lonely, I tend to turn to food for comfort. This usually doesn’t end well. As I gain weight I then feel even worse because now my self-esteem suffers. Leaning into my emotions instead of numbing them with food has been a huge part of my process. When we validate our emotions, we become more aware and accepting of them, and we begin to understand where they come from. It’s only in this place of awareness that we can see what power they may hold over us. Be aware of your triggers. If you know you struggle with specific emotions, such as anger, jealousy, or fear, try to become aware of the circumstances that trigger them. In my own life, I have learned that I often feel angry when I am disrespected or unappreciated. So if I ask my kids several times to do something and they ignore me, I feel anger beginning to rise inside. Not too long ago I would have given in to the emotion and started to shout, whereas nowadays I’m able to tune in to the preceding thought—they don’t respect me—recognize that it isn’t true, and avert the anger. Awareness is power; it gives us the control to choose how we respond. Always remember that emotion is derived from thought. If we find ourselves experiencing strong emotions, it’s helpful to examine the thoughts that preceded them. Then ask the question, are these thoughts based on truth, or my perception of the truth? One of the biggest tools in helping me deal with my emotions has been to write them down. I have been journaling daily for about three years now, always asking questions about my emotions and trying to dig beneath the surface-level thoughts. If I feel at the mercy of my emotions, I’ll ask a simple question in my journal, such as, why do I feel so overwhelmed today? From there I can work back through the sequence of events and thoughts that have led me there. I will then ask a positive action question to engage with another emotion, such as, what is one positive thing I can do for myself right now? If you don’t have time to write, try to at least ask the questions. It’s true that other people’s words and actions affect us, but we also need to take responsibility for the emotions we feel in response to those words and actions. No one can make you feel anything; it’s always your choice. So often the reactive emotions we feel are based on our own perception of the truth, and on the things that matter to us. Being late may be one of your triggers for anger, but for someone else it may be their norm and no big deal. Consider also that people act a certain way based on many influences that differ from your own, such as culture, upbringing, beliefs, and life experiences. When you’re strongly connecting with a negative reactive emotion, it’s important to take time away from the person or situation you are reacting to. Never act on strong emotion. Wait until you are feeling calm and have given yourself time to rationalize and think. Only then should you act. Even if the emotion is a positive one, it can still lead you down a destructive path. How many times have you done something you later regret in the name of love? It’s easy to say, “Take time away,” but hard to do in the heat of the moment. If I find myself beginning to anger and I’m not able or quick enough to remove myself from the situation, I try to connect with my mantra. A mantra is just a word or short phrase that helps you become aware of your emotion and not be controlled by it. The word I use is “soft” because I associate this with a gentle temperament. For you it may be something completely different, depending on the emotion you are most reactive to. Ultimately, it’s important to remember that you are not your emotions—you have the ability to decide if they lead you or if you lead them. As you build awareness and learn to recognize your triggers, you will become increasingly savvy about when your emotions are serving you well and when you may need to take charge of them. Claire De Boer is a writer and teacher with a passion for stories and a strong belief in their power to heal and connect us. Her vision is to empower people to become their authentic selves and to live more abundantly using the tool of writing. Visit Claire’s website to access her free eCourse and content library.